Abbot James Albers, OSB, and the monks of St. Benedict’s Abbey present the Lumen Vitae Medal to past Supreme Knight of Columbus Virgil Dechant and his wife Ann. KANSAS CITY, Mo. — Over 700 people gathered to support the prayer and work of the monks of St. Benedict’s Abbey in Atchison at the fourth annual Abbot’s Table at the Sheraton Crown Center in Kansas City, Missouri. The monks presented the Lumen Vitae Medal to past Supreme Knight of Columbus Virgil Dechant and his wife Ann, and to past Benedictine College president Dr. Dan Carey and his wife Terri. The event offered guests a look into the lives of the monks through a series of dramatic and humorous videos, which have become the signature of the Abbot’s Table. Abbot James Albers, OSB, announced that the monks received an anonymous $100,000 challenge gift to sustain their lives of prayer and work. The guests responded with generosity sufficient to meet the challenge. Abbot Barnabas Senecal, OSB, began the evening with a heartwarming rendition of “O God, You Search Me.” Event emcee Benedictine College professor Dr. Edward Mulholland expressed his gratitude to the monks and remarked that his children — in grade school, high school, and college — attend schools at which monks serve as chaplains and on the faculty and staff. 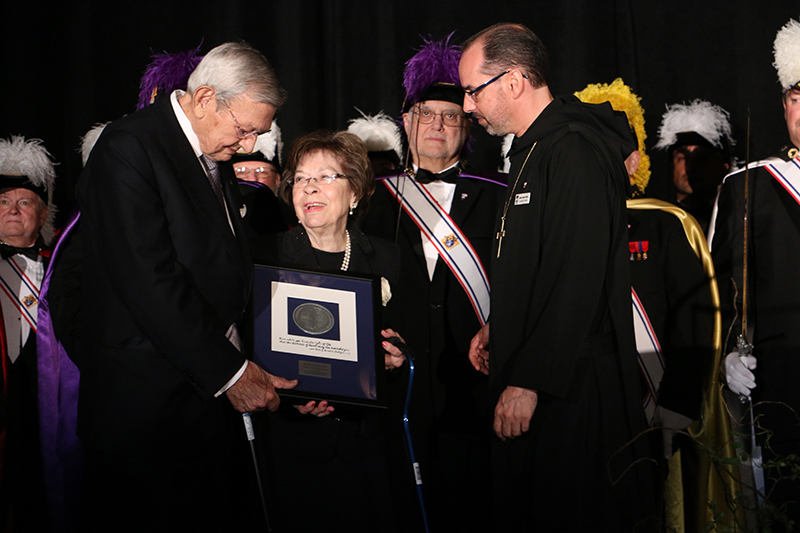 As Abbot James prepared to present the Lumen Vitae Medal to Virgil and Ann Dechant, he was joined on stage by an honor guard of 30 fourth-degree Knights of Columbus. More than 75 Knights attended to honor the Dechants’ lives of service and hear Virgil Dechant’s impassioned remarks on religious liberty. A plethora of friends and Benedictine College alumni and supporters were on hand to praise the work of Dan and Terri Carey as well. Dan Carey offered his gratitude to the monks. The event closed with an announcement that the fifth Abbot’s Table banquet will be held April 22, 2017, at the Sheraton Crown Center. The Lumen Vitae Medal will be presented to Elmer Fangman, a friend of the monks and past dean of Benedictine College, and Auxiliary Bishop Robert Barron of the Archdiocese of Los Angeles. Bishop Barron is renowned for his work with Word on Fire ministries and a variety of other media.